On Monday [25 July], Guinea’s state-controlled media regulatory agency imposed a “temporary” ban on media coverage of the July 19 attack on the private residence of President Alpha Conde, silencing private radio and television talk programmes in which critical questions were being raised about the episode. In such circumstances, Guinean listeners turn to foreign media outlets such as France’s state-funded international broadcaster, Radio France Internationale (RFI), the most popular station in Francophone Africa. With programmes such as “Appels Sur L’actualite”, a daily news call-in show, RFI is considered by millions of African listeners to be an essential source of news and information. Wednesday’s “Appels Sur L’actualite” began with an ominous statement read by host Juan Gomez. “We had planned this morning to debate the attack last week against the residence of the Guinean president, but yesterday the National Communications Council of Guinea decided to temporarily suspend any programme or article about the attempted assassination against the head of state as well as all call-in programmes.” Gomez told listeners they would have to debate another topic. Squeezed between the expectations of listeners and the conditions set by governments leasing the local frequencies it needs, RFI found itself in a difficult position. “We are not submitting to a censorship measure; we regret it and we hope that it will be temporary.” RFI deputy director Genevieve Goetzinger told CPJ today [28 July]. RFI has suffered for its critical reporting on current events in Africa. The station has seen its reporters expelled from Chad, Rwanda, and Senegal, its local correspondent jailed in Niger, and another correspondent killed in the Ivory Coast. RFI has had its broadcasts temporarily banned in a number of countries, most recently in the Democratic Republic of Congo where the government of President Joseph Kabila sought the removal of RFI senior reporter Ghislaine Dupont, the station’s DRC specialist who was expelled from the country in 2006. Nevertheless, RFI management remains adamant the station will continue to report without interference. “Our editorial line is set in Paris, in complete independence from all the governments in the world,” Goetzinger said. As a follow-up, RNW Media Network noted that the temporary ban was eventually lifted. As with Fiji, Burma, Zimbabwe and many other countries where the ruling party arbitrarily tries to block free speech, shortwave radio cuts through censorship without regard for national borders. This entry was posted in Broadcasters, Current Events, News and tagged Free Speech, Guinea, Radio France International, RFI on July 31, 2011 by Thomas. The Tecsun PL-380 is an "ultralight" that has exceptional shortwave sensitivity and selectivity. I have gone through the SWRI and tagged all portable shortwave radios that are considered “ultralights” by the ultralight “Definitions Committee.” Note that “ultralight dxing” is primarily a Mediumwave hobby, but you will find that many of the best performing ultralights are also capable, if not best-in-class shortwave receivers. It is a simple shirt pocket-sized radio of not more than approximately 20 cubic inches. It is an entertainment-grade radio, as opposed to enthusiast’s radio. As such, it will usually not have AM synchronous detection, SSB clarification or other specialized features. It is readily available to the hobby in new or used markets at the time of its approval. It costs no more than $100 retail at the time of approval. It is primarily a radio. While it may have other features as well (MP3 recorder, etc. ), the design and function should have radio reception as its focus. It is not a “novelty radio” such as Coca Cola Can radio, Mr. Potato Head, etc. Each radio is individually approved before it is considered an ultralight. The Tecsun PL-310, PL-380 and C.Crane CCRadio-SWP are three shortwave ultralights that I regularly use and are considered fine examples of ultralights. The Utralight DX Yahoo Group – This is where all of the ultralight DXers communicate. There are loggings, radio reviews, hints and kinks all to be found here. DXer.ca’s Ultralight Shootout – Excellent, authoritative reviews of many ultralights. This entry was posted in Radios, Reviews and tagged C. Crane, Mediumwave, MW, Shortwave Radios, Tecsun PL-310, Tecsun PL-380, Ultralight DXing on July 30, 2011 by Thomas. Shortwave radios have been a tool of the espionage trade for many years. Radios can transmit information encoded to be picked up by the receiver and then decoded. This technique was used throughout World War I, World War II, and the Cold War. Like Steganography, radiograms are still being used today. […]The techniques were used by the Soviets during the Cold War many years ago, but it seems that they have remained long-lasting fixtures in Russian Espionage. We actually reported on this back when news broke about the russian agents who used numbers stations for espionage purposes. Yep, shortwave radio is your friend if you don’t want people tracing where you are and what you’re listening to. Mind you, when you live in a country that suppresses free speach, you also reach for a shortwave radio. Read the full article that details four other popular espionage techniques from the former Soviet Union. This entry was posted in Articles, Current Events and tagged Espionage, Russian Agents, Russian Spies, Shortwave Radio, USSR on July 28, 2011 by Thomas. John Kanzius standing next to his Kanzius RF device. There are few people in the radio world that I admire more than John Kanzius, K3TUP (SK). John took knowledge from his amateur radio hobby and applied it to the medical field–specifically, to fighting cancer. Kanzius RF Therapy is an experimental cancer treatment that employs a combination of either gold or carbon nanoparticles and radio waves to heat and destroy cancer cells without damaging healthy cells. The specific absorption rate for radio waves by living tissue in the proposed wavelengths and intensity levels is very low. Metals absorb this energy much more efficiently than tissue through dielectric heating; Richard Smalley has suggested that carbon nanotubes could be used to similar purpose. If nanoparticles were to be preferentially bound to cancer sites, cancer cells could be destroyed or induced into apoptosis while leaving healthy tissue relatively unharmed. This preferential targeting represents a major technical challenge. According to a presentation by Dr. Steven Curley, the types of cancer potentially treatable using Kanzius RF therapy include essentially all forms of cancer. Kanzius built a prototype Kanzius RF device in his home, and formed Therm Med., LLC to test and market his inventions. The device was successfully tested at University of Pittsburgh Medical Center in 2005. As of 2007-04-23, preliminary research using the device at The University of Texas M. D. Anderson Cancer Center and the University of Pittsburgh Medical Center has shown early promise. If federal approval is granted, testing on human patients may follow. An article published in late 2010 illustrates that radiofrequency fields induce intracellular hyperthermia and necrosis in pancreatic tumors without injury to the human pancreatic tissue grafts tested. Perhaps the reason John has been on my mind today is because, just last week, my wife lost her mother to a vicious, aggressive form of cancer called carcinosarcoma. She was only 68, otherwise healthy and in the prime of life, with young grandchildren. We hold her memorial service today. Our family supported her as she bravely fought this cancer for more than 4 years, beating the 2 year survival statistics she was quoted by various oncologists. Carcinosarcoma is very resilient to the effects of chemotherapy and spreads so widely through the body that radiation eventually can only be used for palliative purposes. Without the efficacy of chemotherapy and radiation, one does not have other viable treatment options for such an aggressive cancer–at least not currently. Readers may have noted the “SK” after John’s ham radio callsign above. SK stands for “Silent Key.” John passed away on Feb 18, 2009 from pneumonia–a complication brought on by his own battle with cancer. Prior to his death, John established a 501(c)(3) nonprofit, The Kanzius Cancer Research Foundation, to carry on his research and human trials of the Kanzius RF therapy. Today, my family and our local community will celebrate the life of my mother-in-law, Jean. Her passion for nature, her knowledge of science, her love of family and her remarkable faith in humanity and Divine power were/are inspiring to everyone she knew. John Kanzius, I celebrate your life today too, and am happy that your research and vision lives on! May it inspire future cancer treatment. This entry was posted in Articles and tagged Cancer, John Kanzius K3TUP, Kanzius RF device on July 24, 2011 by Thomas. I have gone through our Shortwave Radio Index (SWRI) and tagged every portable radio that is based on the Silicon Labs Si4734 DSP chipset. The Si4734 has been one of the biggest innovations to happen to portable receivers in recent years. 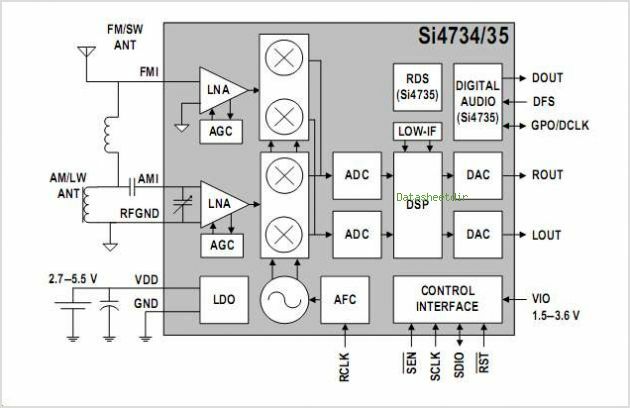 When implemented well into a receiver design, the Si4734 can give a small portable exceptional selectivity and sensitivty through the power of DSP (Digital Signal Processing). This entry was posted in Radios, Shortwave Radio Index and tagged Shortwave Radio Index, Si4734, SiLabs, Silicon Labs, SWRI on July 23, 2011 by Thomas.